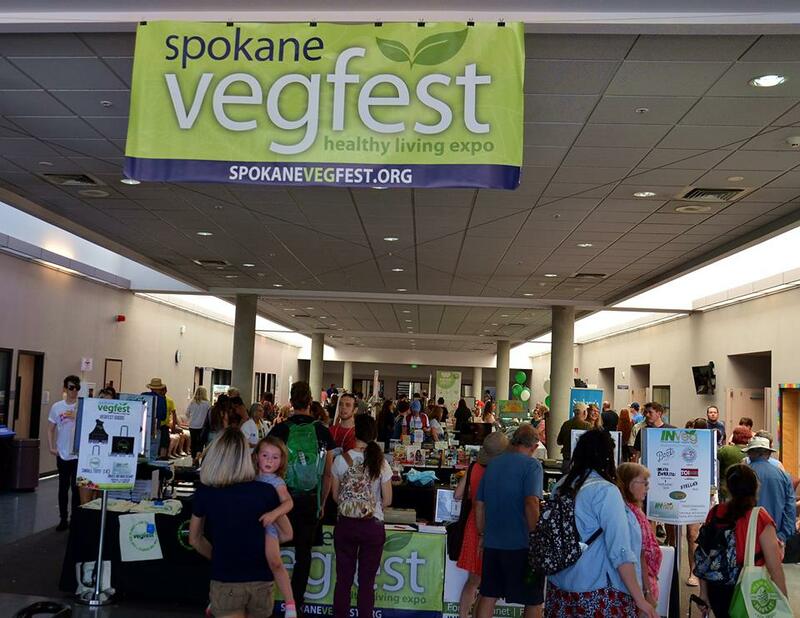 Spokane VegFest 2019 is on July 27th. We are open for vendor registration. Click below for more information. Come and join us for a fun-filled monthly food sharing event. We average 60-90 people each month. Learn more about these events by clicking below. New to the area, Veg-Curious or wanting a new place to eat? We have created a list of most of the vegan options in our community. We are thrilled to announce that our Thanksvegan potluck made the front page of The Spokesman Reveiw! Thank you to everyone who helped make it such a wonderful event especially Travis and Cindy Griffith who provided the amazing Thanksgiving decorations. Our potlucks are a chance for the community to gather and share in delicious food, friendship, and compassion. The potlucks are held the 3rd Sunday of every month from 5-7pm. Learn more about them here. Thank you to all those who came and shared in this event. We are wanting to become a lot more active and help build a stronger vegan community. We would like to have more monthly events than just the potlucks. We are considering a monthly meetup at a local restaurant such as Boots or Allie’s Vegan Pizza. We also will be starting up the Spokane Veggie Running Group again when the weather gets a bit warmer. If you would like to be notified of our INVeg events please subscribe to our events on our Facebook or Meetup page. Please join us for our monthly potlucks, held at the Spokane Woman’s Club, from 5-7 pm on the third Sunday of each month. Most months we bring a speaker or chef to present on a plant-powered topic. Spokane Vegan Outdoor Enthusiasts was meeting every Wednesday but is taking a break because of low turnout. If we have enough interest in the group, we will bring it back. If you are interested in joining us then please join the group on facebook. We meet at 6pm usually in front of Boots Bakery,but the location does change from time to time so double check facebook before you go. There are Walkers, Runners and even Rollerbladers in the group. If you would like to coordinate another type of outdoor activity like a bike ride or rock climbing day please let us know. We have a parenting group that is supporting local vegan parents by connect each other. We have had 2 events so far and more are on the way. If you would like to help with this, please email us. Spokane VegFest was a huge success. Thank you to all those who volunteered at the event or provided sponsorship, you helped make this possible. The energy was high and everyone had a wonderful time. We had the biggest turnout to date, with more than 3,000 by closing. Vegan, vegetarian and veg-curious individuals came through the doors to connect and learn more about a compassionate life. Our keynote Speakers Josh Lajaunie, Chef AJ and Jasmin Singer spread the message of love and kindness to all beings. Guests were introduced to a variety of vegan foods, goods, personal products, people, information, and activists. This year we introduced a few new features to Spokane VegFest. The first was a room solely dedicated to cooking demos. The topics included: cooking and baking with kids, truffle making, raw food creation, whole food plant based meals and even vegan dog food! The room was packed from the morning to night. Next year we will see how we can make this even more effective. The 2nd new feature we added was Kid’s VegFest. Kids VegFest was a hit! We had 5 booths and a gigantic bouncy castle outside where kids could be kids. We also had a clown, face painting, and coloring activities. The 3rd new feature was a room completely dedicated to free yoga sessions. The yoga room was a crowd favorite and we hope to expand it next year with other forms of dance. Thank you for all those who attended, we hope to make Spokane VegFest bigger and better each year. See you in ’18 on July 28th! If you are interested in volunteering or vending next year, let us know! Please visit our Vendor/Sponsor page if you are interested in being a part of Spokane VegFest. If you have any questions, are interested in volunteering or sponsoring us, please e-mail info@inveg.org. Our mission is to provide support for the vegan communities in the Inland Northwest and to educate and provide resources about the ethical, environmental, and health benefits of a plant-based diet to the veg-curious. Based out of Spokane, Washington, INVeg is the founder of Spokane Vegfest: Healthy Living Expo and the monthly Spokane potluck which features a different presenter or cooking demonstration each month. We teach Vegan 101 classes throughout Spokane, offer a membership program, table and leaflet at various events, provide vegan-friendly resources on this website for various cities in the Inland Northwest, provide vegan Thanksgiving meals to families in need, and more. We focus on a gentle approach to education – through compassion, patience, and of course – food! If you are interested in membership, volunteering, or would like more information, please e-mail us. We are needing volunteers who can assist with: tabling, writing, designing, researching, and more. Membership is only $20 per person per year or $35 per family. Your money helps us a non-profit organization pay for vegan education and events, including Spokane Vegfest, rent for our monthly potluck space, speakers, and materials, leafleting materials, and much more. In return, you will receive a discount card for various vegan-supportive businesses in Spokane and the peace of mind that your money is supporting compassionate education. "To unite in compassion and educate about the ethical, environmental, economic, and health benefits of a plant based diet." © INVEG 2013-2017 | A Loving Cooperative Project.